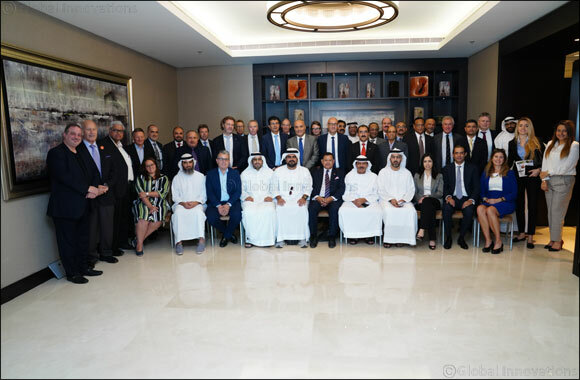 Dubai – United Arab Emirates – 11th of September 2018: Under the patronage of the Federal Transport Authority for Land and Maritime “FTA”, Tactics Maritime Media and Marasi News have successfully arranged “The UAE Maritime Leaders Roundtable Discussion” under the theme of “To what extent do the UAE ports meet the current demands of the shipping industry?”. The roundtable’s participants came up with effective solutions that will be presented to the concerned authorities to take the necessary actions in order to drive the UAE’s ports towards innovation and efficiency. The roundtable was held with a significant support from Emirates Classification Society “Tasneef” and was sponsored by major maritime entities including Dubai Maritime City, Gulf Navigation Holding, the Norwegian Classification Society “DNV GL”, Folk Shipping, WIN GD, Ince & Co. and Baker McKenzie Habib Al Mulla. The Federal Transport Authority for Land and Maritime has issued a number of decisions in response to the first Maritime Leaders Roundtable recommendations. These decisions covers a number of aspects, such as H.E Dr. Abdullah Belhaif Al Nuaimi declaration during the annual meeting, to draft a new maritime investment law that is different from the trade law and takes into account the dynamics and specifics of the maritime industry. In June 2018, the FTA joined the Convention of Facilitation of International Maritime Traffic (FAL Convention). This will facilitate all procedures related to maritime investment. In addition to communicating with Ministry of Justice in order to establish a court specialized in maritime issues. Regarding shipowners requests to abolish the requirements of the navigational licensing certificates that significantly hinder ship owners in the UAE and is an obstacle for foreign vessels wishing to enter the UAE territorial waters for maintenance or other services such as marine classification. The decision came in July 2018 stating that a letter from the port is enough instead of prolonged contracts. Moreover, FTA is working on the necessary measures that facilitate the requirements for ship navigational licenses and change related laws in a way that significantly serves the interests of ship owners. Furthermore, FTA has announced including a special section in the new maritime law in order to increasing the UAE's ability to attract ship owners. This required an in-depth study of the key aspects that sector leaders look for in the host country. These include ease of doing business and building a resilient and flexible mechanism to regularly review and update maritime laws to facilitate procedures in order to attract foreign investments. This mechanism should overtake the red-tape requirements to amend laws and decrees. Regarding revising the Value-Added Tax (VAT) law and drafting new and developed provisions for the maritime sector that take into account exempting the sector from all VAT-related measures. This includes obtaining insurance services, supplying support staff and services, and other issues related to the sector to ensure its competitiveness and help it attract companies from other countries. FTA has announced preparing for a meeting with the VAT committee in order to discuss drafting new provisions related to the maritime sector. Currently, FTA is coordinating with the Ministry of Education to include maritime curricula in the basic educational stages to underline the importance of the sector among the younger generations, rebuild the image and reputation of Emirati seafarers in the minds of the younger generations. Moreover, FTA is studying the possibility of including A Seafarer' Day as a national holiday and they have met with Ministry of Culture and Knowledge Development to spread awareness regarding the same. Finally, FTA is conducting an in-depth study to unify the UAE Maritime industry as a standalone sector.